You may not think about Portuguese history when you visit Kenya, but Fort Jesus in Mombasa offers you a glimpse into Europe's colonial past as well as Africa's. You'll find that Fort Jesus is Mombasa's best historical site. The fort has official, personal guides. They are friendly and knowledgeable, and can also show you around in Mombasa’s Old Town, the historic city centre next to the fort. The only downside is that some don’t really take no for an answer. They don’t cost much, though, and you’ll be glad you hired one. Built by the Portuguese in 1593, the fort sits on a ridge of coral near the entrance of Kilindini harbor. At the time of construction, there were colonies of Portuguese living on the eastern coast of Kenya and the fort was intended to protect them. Turkish raids during the late 1500s prompted the need for more protection. Over time, the fort was under the control of either the Portuguese or Arabs from Oman. These two people battled for control of the fort on many occasions. Elements of Portuguese architecture are still clearly visible in the ancient fort, even though it has undergone many additions and changes over the centuries. Given its age, the buildings have weathered fairly well. Much of the lower walls were built from the local coral. The fort was designed by Portuguese architect Joao Batista Cairato, and covers an area approximately 2 acres in size. Fort Jesus was used as a military fortification for much of its history, until the annexation of the territory by the British in 1895. They reconstructed the insides of the fort, turning it into a prison. It's importance as a historical site was recognized in 1958 when the area was declared an official National Park. The site was excavated to lean more about its history and to preserve any archaeological material still there. Today, the fort is home to a museum. After so many years of the complex changing of hands, it was turned into a museum in 1962 with grant assistance from the Calouste Gulbenkian Foundation. Artifacts are on display from the Fort Jesus site itself as well as from other historical sites, such as Gede, Ungwana and more. Most of the artifact collection is made up of ceramics, jars and military equipment. 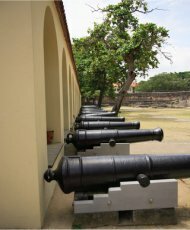 Many cannons are also on display, though they are much more modern and of English origin. The buildings and structures still standing in the fort today include the old church, the great water cistern, barrack rooms, parapets, turrets, and a number of storage rooms, housing quarters and other intact chambers. The fee to visit the Fort Jesus museum (for non-residents) is 800 KSH. 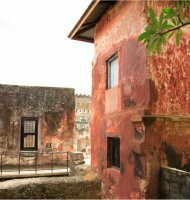 You can find the fort on the coast of Mombasa island, near the popular Old Town neighbourhood. If you enjoy visiting museums, other nearby sites you should try to visit are the Muslim ruins at Jumba la Mtwana, the missionary museum at Rabai and another site of mosque ruins at Mnarani. While these other sites are worth a visit, they're no where near as impressive as Fort Jesus in Mombasa.